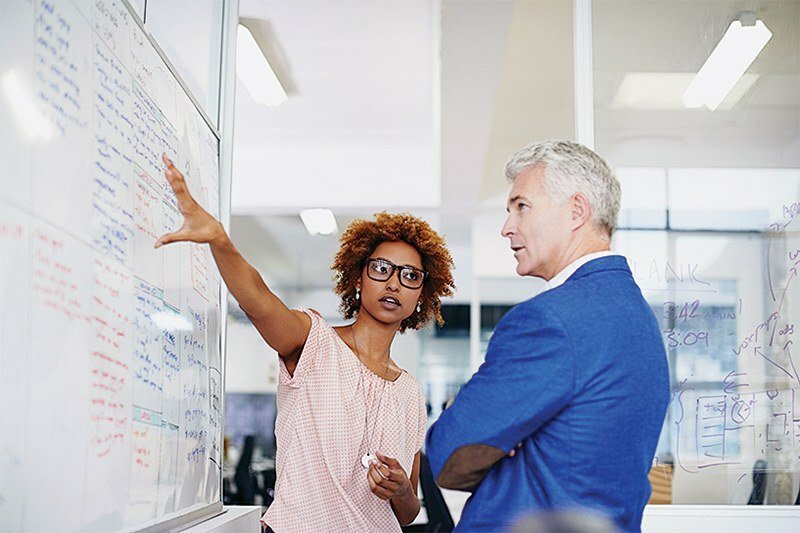 Organizations today are faced with a unique challenge: management needs to encompass the needs and skill sets of the most diverse labor workforce ever. Although workforces that comprise multiple generations is not new, the span of years represented has never been so wide. Many workplaces today are represented by four generations. Two camps, the Millennials (born between 1980-1995) and Gen Xers (born 1965-1980), comprise the majority, in numbers, of most companies. But equally as vital to an organization’s culture is the up-and-coming Post-Millennials/Gen Zs (born 1995-2012) and soon-to-retire Baby Boomers (born 1946-1964). Innovative organizations are looking to reverse mentoring, also called peer mentoring, co-mentoring, and multi-generational mentoring, as one way to bridge generational gaps. Reverse mentoring, like standard mentoring, pairs of older team members with young ones. But here’s the twist: the younger team members drive the training. Junior employees are provided with the opportunity to showcase their technical skills and leadership abilities and receive career-boosting access to senior team members. Older employees obtain the opportunity to pick up new digital skills, hear fresh perspectives, and embrace new ideas. Reverse mentoring is a two-way street. With multi-generational participation, professional development benefits are received by both the mentor (junior team member) and the mentee (veteran team member). Establishing a reverse mentoring program can help bridge generational gaps within your organization and reduce the impact of continually changing workplace demographics. And demographic shifts in the workforce are inevitable. Through 2017, the latest full year for available figures, the two largest workforce groups, Gen Xers and Millennials, accounted for almost the same size group of U.S. workers – 33% versus 35%, respectively. But, by 2025, Millennials will make up more than 75% of the workforce. Accelerating the professional development of Millennials will help fill leadership roles as the percentage of Gen Xers in the workplace declines and Baby Boomers retire. Since first promoted in the late 1990s by Jack Welch, then CEO of General Electric, reverse mentoring has been embraced by leading companies in many marketplace segments — technology, business, and financial services, healthcare, retail and manufacturing sectors, and the military. Today, reverse mentoring programs often match Millennials and Gen Xers. This is because the Millennials tribe is unique. It is the first generation ever to possess skills and knowledge that previous generations didn’t. The Millennials, sometimes called “digital natives,” are known for first turning to text, instant messaging, and quickly embracing the latest tech tools and devices to interact with their peers. Reverse mentoring provides a way to utilize the abilities of these “digital natives.” They, in turn, are more likely to feel appreciated in their role and engaged with the company. It’s a win-win! Reverse mentoring is a mutually benefitting arrangement. Since tech tools often evolve faster than teaching materials can be updated, older employees can leverage the tech knowledge-base of their younger co-workers to stay current. Reverse mentoring can be especially helpful, too, for senior managers and C-suite executives short on the time to learn the latest technology skills. Reverse mentoring can also help address the elephant in the room. According to the 2018 Deloitte Millennial Survey, 43% of Millennials say they expect to leave their job in the next two years and only 28% plan to stay beyond five years. The findings from this study tell just part of the story. An industry-wide survey from Formaspace Office provides additional insights on this topic. Studies show this historic turnover rate is troubling for many companies. Why wouldn’t it be? According to Society for Human Resource Management (SHRM), the costs to replace a salaried employee is the equivalent of six to nine months of wages. Considering that the time to fill a given position is 42 days on average, retaining good employees helps ensure the long-term stability of an organization. It stands to reason that organizations that provide employees with opportunities to grow professionally are more likely to hang on to them. Organizations that have launched reverse mentoring programs have seen a reduced turnover rate among various generational groups according to PwC’s Millennials at Work study. Younger employers feel more recognized and valued for their talents. Through reverse mentoring sessions, they provide perspectives about what it is like to sit in a management chair and hold a leadership role. The benefits of reverse mentoring programs cited by top companies are multi-fold. To address its concerns about recruiting and retaining valued employees, the Hartford Financial Services Group conducted its own survey of Millennials. Top actions the company could take to retain younger employees involved in training, developing, coaching, and mentoring. Management was also aware that consumers were increasingly looking for information about insurance, the primary product offered by the company, through the Internet. Establishing a reverse mentoring program was a double-win for The Hartford. Younger employees played a greater role in advancing technological innovations at the company. Older employees learned how to better leverage digital and social media tools to reach new customers and enhance intra-team communications. Both camps soon realized the benefits of the multi-generational exchanges. The reverse mentoring program began as a test pilot at The Hartford, with 12 Millennial mentees engaging in five to seven sessions with senior leadership. Embraced enthusiastically from the beginning, at program’s end, it was rated “extremely effective/effective” for Business by 80% and for Personal by 97% of the mentees. The program was then rolled out to more than 50 mentees in seven states and, following this, became a national program at The Hartford. Participation in the program now is highly anticipated: 94% of those surveyed at the company said reverse mentoring will be valuable for them. The Hartford tapped into its “technology kids” to mentor senior leadership. The reverse mentoring pilot program at AXA, the international financial services industry organization, was rolled out to achieve two objectives: better understanding of the digital behavior of its customers and better equipping of senior leadership in the use of digital and social media tools. At the end of the test program, enthusiastic participants encouraged an expansion of the program. AXA, today, takes pride in its digital reverse mentoring program and points to the support shown throughout the company. By the end of the first year, more than 1,000 AXA employees from 26 countries volunteered to participate. After two years, the company counts more than 1,500 employees in 28 countries as program alumni. Internal surveys show that 97% of the mentors and mentees have voiced their approval of the program. The experience of two AXA reverse mentoring program participants was featured in a recent SHRM article. The mentee, 23-year AXA veteran Dave Hattem, learned how to leverage social media, plus develop his skill sets with technology and various software programs. His mentor, Jérémie Berthon, had been with the company for just three years and said the experienced enhanced his institutional knowledge and visibility at the company. AXA’s “digital natives” prepare for reverse mentoring sessions on digital topics that support business and cultural transformations at the company. Implementing a successful reverse mentoring process is a multi-step process that focuses on two key pillars: being open to embracing new work strategies and cultural changes, plus accepting generational and cultural differences. A recent Formaspace Office article, 10 Tips for Successfully Managing Millennials in Your Organization, provides additional insights. In the following section, we’ll outline five steps your organization can use for rolling out a successful reverse mentoring program. Get upper-level management on board with the reverse mentoring program. Secure support for your program from an executive sponsor. This should be someone at the top level of your organization, such as a vice president, who will champion the program and encourage other leaders to get involved. The program won’t be effective unless there is senior leadership support. Create a plan and formally implement it with meetings and on-going communication. Develop a reverse mentoring program based on solid business goals. Set realistic engagement objectives, such as meeting once or twice a month for six months. Clearly define the purpose, objectives, meeting, and communication check-in timetables to demonstrate your organization’s commitment to the program. Set clear expectations and share success stories. Mentees and mentors need to understand the importance of nurturing a personal connection. Time should be allowed for younger workers to discuss their career goals and talk about their concerns. Older workers should be allowed time to offer their business and industry insights. Equally important is sharing wins. Evangelizing reverse mentoring program success stories help promote best practices that could be implemented throughout the organization. After mentors and mentees have been matched up and one or two sessions held, a check-in should be scheduled by the program facilitator. This will help determine if the participant synergy is positive. It is OK if there are personality clashes. The match-up can be revisited and participants reassigned if necessary. A mid-point check-in ensures both parties benefit from the association and that progress is being achieved. A post-program review enables the sharing of what was and wasn’t learned, plus program feedback. This information can be included in a senior leadership team report. Leverage program learnings to jump-start innovation and the exploration of technology trends. Your organization’s reverse mentoring program provides an excellent opportunity for employees to acquire vital knowledge. Plus, employees will feel more connected to the organization and its values. The program can serve as a launching pad for generating innovation and demonstrating agility in response to technology challenges. At Formaspace Office, we support the concept of reverse mentoring. Our Millennial employees are encouraged to take on more responsibilities and to step into management roles. One way we implement this at Formaspace Office is within our newly founded Culture Committee. Our Senior HR Manager and Culture Committee Leader, Angela Shaw, had an interesting perspective: “Culture can certainly always be improved upon, even here at Formaspace Office. I believe culture is a living and breathing thing, and it’s our responsibility to make sure that everyone feels valued and has a voice within the workplace.” Encouraging Millennials to step into management roles enhances diversity and culture, helps the company grow, and gives senior level executives a different perspective for strategic actions. One way to keep communication fresh between different generations within your company is by utilizing an open office floor plan and office furniture that inspires collaboration. Our tips include incorporating pop-up offices and huddle rooms to encourage employee interactions. Another solution is the Formaspace Office custom gallery panels to improve workspace designs and provide a visual differentiation between departments or functions within the office. Office aesthetics are important, especially to Millennials. Respondents to the Formaspace Office Survey of Employee Satisfaction cited the design aesthetic of the office as the number three reason they find a company attractive when they are looking for a new job. With Formaspace Office eye-catching office furniture, your organization can convey its personality and create an attractive and appealing workspace environment. Formaspace Office Custom Gallery Panel features 16 Ga Steel Frame and 11 Ga Steel Powder Coated Silver Gray with a custom laser cut pattern for a large tech giant in California. Learn more about the benefits of open office environments for employees. Contact your friendly Formaspace Office Design Consultant today to discuss the options best suited for your workspace. For more Formaspace Office open office furniture designs, check out some of the work we’ve done for top companies in the United States. This product is 76” high, powder coated in Turquoise on casters with 16-gauge steel frame mitered corners. Contact your Formaspace Office Design Consultant today for custom furniture information or to modify our standard furniture products with the Virtual Furniture Designer, 3DConfigure tool. All of our furniture products are proudly made here in the U.S. and backed by our 12-year warranty. To learn more about us, please check out our Who is Formaspace Office video and be sure to visit our website for more information about us and how you can get involved. https://formaspaceoffice.com/wp-content/uploads/2017/05/FS_office-full-mint-logo-300x62.png 0 0 Mehmet Atesoglu https://formaspaceoffice.com/wp-content/uploads/2017/05/FS_office-full-mint-logo-300x62.png Mehmet Atesoglu2018-10-10 16:46:182018-10-10 18:17:50Should Your Company Embrace Reverse Mentoring?